Crabtree & Evelyn’s iconic Noel collection is celebrating its 25th year of creating the perfect Christmas ambiance in your home. With warming notes of fresh evergreens, bayberry, cranberry, orange, persimmon, cinnamon and star anise, the Noel Home Fragrance Spray instantly fills the home with the decadent aroma of Christmas. So, what better way to embrace the season than with a free bottle of this joyful Christmas fragrance? 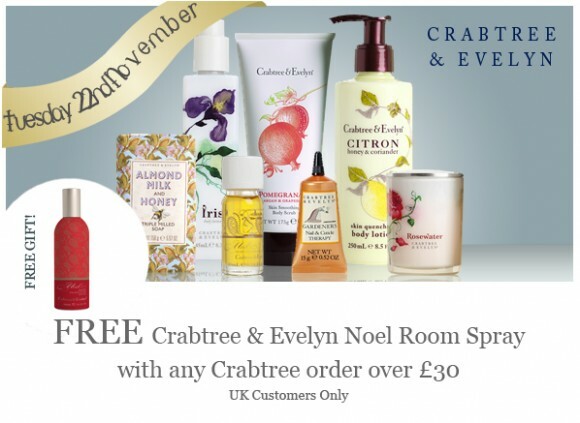 Spend over £30 on any Crabtree & Evelyn products – including the brand new Pomegranate and Noel collections – and you’ll receive a bottle of your very own. Take a look at the entire Crabtree & Evelyn collection right here at Escentual.com. *Offer open to UK residents only as we can’t ship those pesky pressurised containers overseas. This entry was posted on Tuesday, November 22nd, 2011 at 8:00 am and is filed under Christmas, Gifts, Offers. You can follow any responses to this entry through the RSS 2.0 feed. You can skip to the end and leave a response. Pinging is currently not allowed. @escentual @totaalaamoudi Sorry for the delay. Our customer service team will be in touch via email with more information.